I just cut up small strips of paper, ran a bit of repositionable glue down the centre of the card to keep them in place, and then sewed them all down. I capped off my tree with a cute button. It's a little lopsided but hopefully that just adds to the charm. Just to clarify...I used scraps of paper, but using fabric would be fun too! Super cute idea! Thank you for sharing. Very clever!!! Would work well with fabric, too. very cute!! I love the way you just sewed on the card. I love anything scrap busting, very cute! Oh sweet idea! 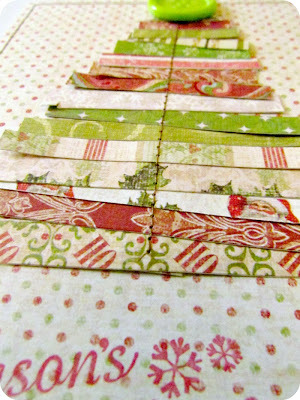 I have a lot of those strips left over from another project cut out of Christmas paper I could use, thanks! This is a great scrap idea, I love how it's so simple and so cute! These projects that use up ends are great! Thanks for sharing. WOW...I love this. I pinned because I do sew!! Ah, you're playing my tune here. 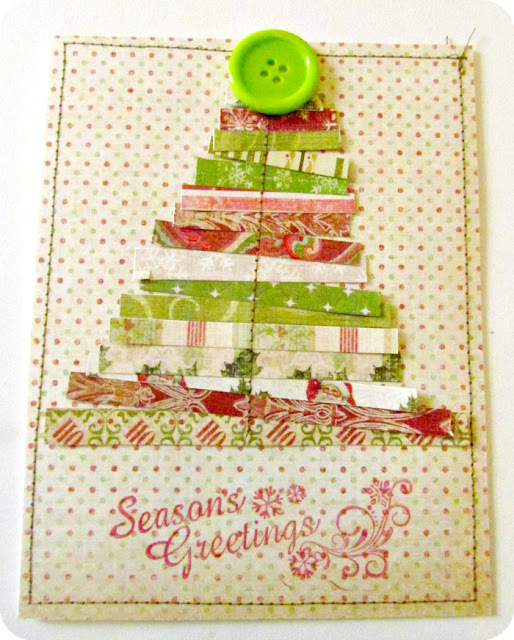 I love making cards and I LOVE this scrap-busting idea! Pinning immediately! Love this! What a perfect way to use up all my pretty scraps - I just hate to throw them away! I love the design and stitching. So simple and pretty. This is great! I've been trying my own hand at homemade cards this year. Very cute! You are inspiring me to use up the bits of Christmas paper I have from last year. I love this. I save ALL my paper scraps to make cards and tags. Scraps come in handy all the time and the more I use them and see what I can make with them, the less I am able to throw anything in the trash. Lovely, lovely card.